Musical Surprise is the largest music school in the west valley with an active enrollment of 500 students. Students drive from all over the west valley to take lessons here. While you are here researching the best school for you, please consider the benefits of becoming a student at our studio and find out why we are the west valley’s #1 choice for music lessons! The widest range of music lessons and services available in one location. t popular areas of piano, voice, guitar, and violin. We also have preschool music programs available and music therapy for special needs! Ask us about discounts for multiple family members! The largest and most qualified music teaching staff in the west valley. With 30 teachers, you can be confident that we have the right teacher to meet your individual needs. We hire degreed teachers, board-certified music therapists and professional performers. We have someone available to teach almost any music style and genre to all levels of students. Our teachers have warm personalities, are extremely friendly and dedicated to teaching you the style of music that you want to learn in your music lesson. The widest range of music lessons times available 6 days a week. Private Lessons are available by appointment and are first come, first serve so contact us today to arrange your first lesson! Group Classes for beginners are also available. Classes run in 8-week terms and begin in January, March, June, August and October. A proven track record of excellence since 2008. Every year, aspiring music teachers start their own studio and then close it down soon after– not us! Our full time mission is teaching music lessons, and we’ve done so successfully for more than 25 years. We are a privately owned, family business, and we live in this community. We opened Musical Surprise in 2008, becoming the “go-to” place for music programs in the area. Our full-time mission is teaching music lessons, trusted by over 1600 families in the last 7 years! Visit our testimonials page to see what our students are saying! A top-notch facility with professional office staff – this is our business! No more waiting in the car (or someone’s living room), or standing in a music retail store showroom waiting for your student. Our 5,000 square foot Music Center includes a comfortable waiting area with free wi-fi, magazines, child toys and water service. We have everything we need at our fingertips to give your student a quality music education in a comfortable, professional environment. We provide glass doors on all of our studios and classrooms and you can even sit in on your student’s lesson. We have everything you need to get started. Our lesson rooms are large and spacious and are stocked with amps, guitars, pianos, keyboards, stands, full drum kits and more. We have even built a room-within-a-room for our drum studio and added sound proofing materials in the walls, ceilings and air-ducts throughout our facility. We have instruments, books, strings, reeds and supplies in our retail store and instrument rentals are available too– all we need is YOU. Specialized programs for all types of students. We use a variety of specialized programs specific to our students’ needs. Our Music Explorers program introduces musical concepts to preschoolers, Mini Mozart classes were created to teach young learners ages 3-6yrs the basics of playing the piano, Youth Guitar Classes use adaptive methods for little hands, Adult methods are used for older beginners. We offer adaptive lessons to special learners and have music therapists available for those with special needs. Our teachers have access to technology to incorporate apps, recording, and playing along with your students’ favorite music. We teach Classical to Rock, Bluegrass to Pop- Nobody is left out at Musical Surprise! Performance opportunities at each level of study. We spend thousands of dollars every year to provide a variety of optional performance opportunities to every private student at Musical Surprise. s the opportunity to experience the thrill of playing with a band. Our parents enjoy the laid-back festival atmosphere of an outdoor concert and watching their students’ ROCK! 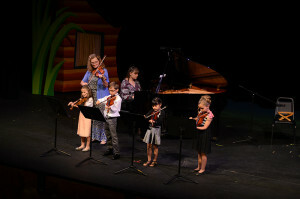 Our Formal Recital is held in a large performing arts center with a grand piano and professional sound and lighting for our classical and traditional musicians. The new Studio Showcase Event is an opportunity to hear various ensembles of our students and staff and is held at a large performing arts center as well. 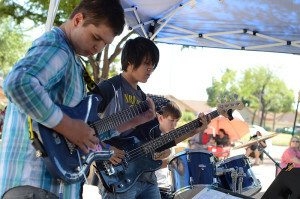 Students are given opportunities to perform throughout the year at local Retirement Homes, Farmers Markets, Festivals, Open Mics and even at local Restaurants. We also host Saturday Afternoon Jam sessions in our studio as well as Performance Parties and Masterclasses so that our students can get used to sharing their music and playing/singing in front of others. 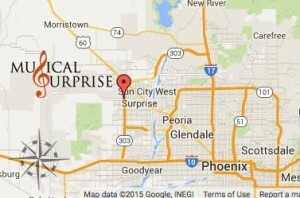 Musical Surprise is conveniently located at Loop 303 and Bell Road in Surprise making it easily accessible from almost anywhere in the west valley. We are in the Albertson’s shopping center (across the street from WinCo) and anchor the opposite end of the shopping center. See a map to our Music Center here. No long-term contracts, we bill tuition on a month-to-month basis or by group class term. We don’t think long-term contracts are necessary- our students make good progress and tend to stay because they want to! If you are ready to start, you have nothing to lose as we only want students who truly want to be here and we do not require semester minimums for lessons. Early morning and lunch time lessons for homeschoolers, retirees, college students and working professionals. Since we are the largest school in the area, we are able to be a ‘full-service’ music school. This allows us to offer lessons as early as 10am and we see many students between the hours of 11am-2pm. If you are a homeschool parent, retiree, college student or working professional who has a flexible schedule, take advantage of our morning and lunch time lesson spots! to arrange your first lesson! preschool music and a full-service music store.